What is the Cost of Preferred Stock? The cost of preferred stock to the company is effectively the price it pays in return for the income it gets from issuing and selling the stock. In other words, it’s the amount of money the company pays out in a year divided by the lump sum they got from issuing the stock. Preferred stock is another form of equity that may be used to fund expansion projects or developments that firms seek to engage in. Like other equity capital, preferred stock enables companies to raise funds. 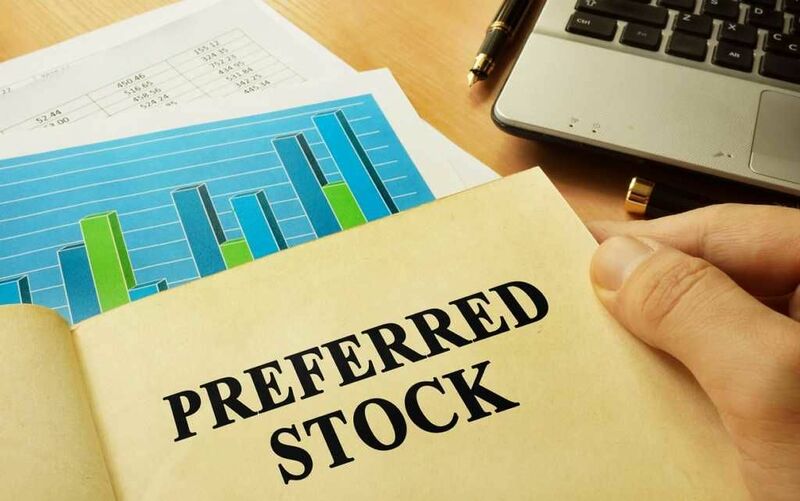 Preferred stock has the benefit of not diluting the ownership stake of common shareholders, as preferred shares do not hold the same voting rights that common shares do. Preferred stock lies in between common equity and debt instruments, in terms of flexibility. It shares most of the characteristics that equity has and is commonly known as equity. However, preferred stock also shares a few characteristics of bonds, such as a par value. Common equity does not often hold a par value. Preferred stock differs from common equity in several ways. A beneficial distinction is that preferred shareholders are first in line to receive any cumulative dividend payments, or dividend payments in arrears. In the event of liquidation, preferred shareholders are also the first to receive payments after bondholders, but before common equity holders. As stated above, the par value is guaranteed on return. Because of the nature of preferred stock dividends, it is also sometimes known as a perpetuityPerpetuityA perpetuity is a cash flow payment which continues indefinitely. An example of a perpetuity is the UK’s government bond called a Consol. Although the total value of a perpetuity is infinite, it has a limited present value using a discount rate. Learn the formula and follow examples in this guide. For this reason, the cost of preferred stock formula mimics the perpetuity formula closely. A company has preferred stock that has an annual dividend of $3. If the current price is $25, what is the cost of preferred stock? It is the job of a company’s management to analyze the costs all financing options and pick the best one. Since preferred shareholders are entitled to dividends each year, management must include this in the price of raising capitalInvestment BankingInvestment banking is the division of a bank that serves governments, corporations & institutions, providing underwriting (capital raising) and mergers and acquisitions (M&A) advisory services. with preferred stock. For investors, the cost of preferred stock, once it has been issued, will vary like any other stock price. That means it will be subject to supply and demand in the market. In theory, preferred stock may be seen as more valuable than common stock, as it has a greater likelihood of paying a dividend and offers a greater amount of security if the company folds. This Excel file can be used for calculating the cost of preferred stock. 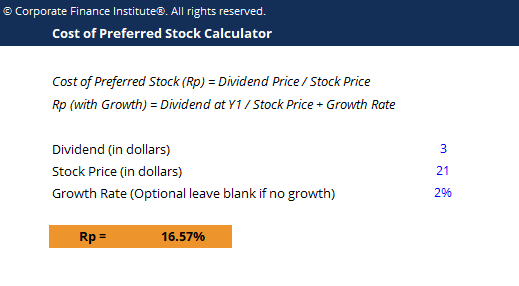 Simply enter the dividend (annual), the stock price (most recent) and the growth rate or the dividend payments (this is an optional field). Thank you for reading CFI’s explanation of the cost of preferred stock. CFI is the official global provider of the Financial Modeling and Valuation Analyst (FMVA)™FMVA™ CertificationThe Financial Modeling & Valueation Analyst (FMVA)™ accreditation is a global standard for financial analysts that covers finance, accounting, financial modeling, valuation, budgeting, forecasting, presentations, and strategy. certification, designed to transform anyone into a world-class financial analyst.